William Blake (1757-1827) was a poet, engraver, visual artist, printmaker, and illustrator. Indeed, in many ways he was one of the first true multimedia artists, fusing word and image into an extraordinary and compelling vision that has inspired everyone from Rossetti and W.B. Yeats to Jim Morrison, Philip Pullman, and Alan Moore. Here, writer Rod Tweedy talks about his early introduction to Blake’s work and explores the exhilarating world of his poetic imagination. I first read Blake at university. I remember telling my tutor that I found his poems “mind-boggling”. “That’s ok,” he replied, casually, “you’re young enough to have your mind boggled.” Blake is still boggling my mind – his extraordinary illustrated poems, like sheets of some fantastic cosmic comic-book, are filled with the most astonishing colours and verse and the most outrageous, mind-expanding poetry. “If the doors of perception were cleansed,” he once wrote, “everything would appear to man as it is, infinite.” This sentence seeped into my consciousness, like wine through water (to use Emily Brontë’s fine image), slowly transforming how I see reality, and how I write. Blake’s comment about the “doors of perception” is not only an observation about how we see things (or don’t see things), but also about how we write things. Blake finds a way to create poetry that actively seeks to alter both how we understand and how we experience the world. His poems consciously bypass the rational parts of the human brain (what today would be called “left brain” functions) in order to appeal to deeper, more intuitive processes. He noted in 1803, in a letter, that his work is “addressed to the Imagination which is Spiritual Sensation” and only indirectly or intermediately “to the Understanding or Reason” – an observation that reveals just how conscious he was about his method of writing. Blake’s poetry sticks in the mind, like a bur. What does he mean? Why “doors” of perception (and not windows?). Can everything really be infinite? If everything is infinite, why can’t I see it? How come my rationality dislikes or doesn’t understand this, but another part of me really does? What’s happening here? That’s just a hint of the boggling that was going on. Blake’s originality has been noted by many critics, many of whom regarded it as a sign of his madness – “an unfortunate lunatic”, as one even more unfortunate contemporary reviewer put it – he is now famous for his misinterpretation of Blake’s work. But what was different about Blake, I think, was his unusual sanity, his remarkably integrated view of the world. Perhaps one of the reasons that he continued into adulthood with a more intuitive, imaginative ‘right brain’ way of looking at reality, was that he did not receive any formal education. Another reason for his unusually developed poetic take on life was his belief in the human imagination, which he considered to be the basic ‘operating system’ of humanity. “The Imagination is not a State,” he once observed, “it is the Human Existence itself” (Milton). This belief allowed him to penetrate deeply into the human mind, and to bring back remarkable, and remarkably prophetic, visions of man’s internal world. He saw, for example, that the contemporary ‘Age of Reason’ was actually the Age of Hyper-Rationality, with the calculating, measuring and literalizing side of the brain constantly running wildly out of control. Blake’s thinking predicts all sorts of things, from the structure of matter (his views on the inter-involved, infinite nature of energy anticipate Niels Bohr and David Bohm) to the structure of the mind, where his theories prefigure Freud, Jung, and Ferenczi. Indeed, many have regarded him as a prophet – which I think he was, in Shelley’s sense of the word: someone who can see into the present. Blake’s poetry is the embodiment of this embodiment: from the strong, pulsing trochaic heartbeat of ‘The Tyger’, to the hammer blows of Los in the long illuminated poems, his words are the poetic skin through which his imaginative forms come alive. 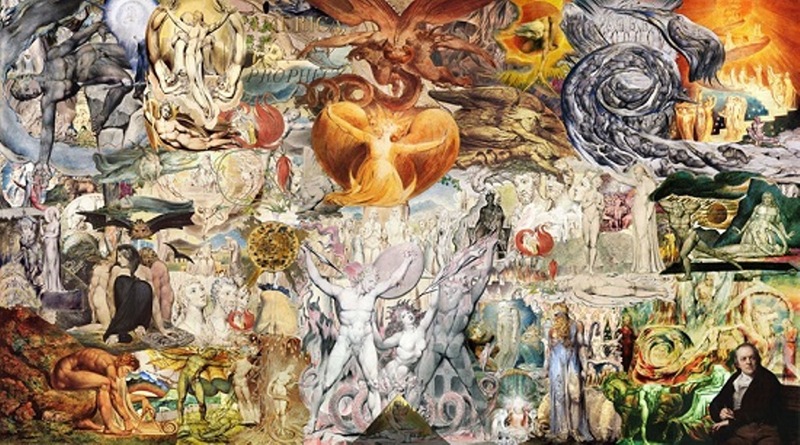 Blake was one of the most grounded of all artists, and he wove his beliefs about energy and the body into his whole imaginative vision of the world. Blake also developed a terse, epigrammatic form of writing that was designed precisely to arrest or challenge the rational brain, yet was accessible to the intuitive imagination, rather in the way that autostereogram (‘magic eye’) pictures work. He assembled a number of these aphoristic observations and published them as the ‘Proverbs of Hell’ which appear at the start of The Marriage of Heaven and Hell. They are some of the most electrifying sentences ever written. Aphorisms are original thoughts written in a short, memorable form. Blakean aphorisms resemble modern-day ‘tweets’ in being short, succinct comments or observations, but in fact they work in completely the opposite direction: whereas tweets tend to be functional, clichéd, and usually simply reinforce the ways people think, ‘aphs’, although limited in form, are expansive and challenging in content – if you’ve understood an aph on first reading, then either it’s not a very good one or you’ve not really understood it. For example, Blake’s comment that “The tygers of wrath are wiser than the horses of instruction” doesn’t make much sense on first reading. This is because the left brain only understands things literally – metaphor is a property of the right brain. To get what Blake means, we have to work at it – the secret of course is to make poetry work in such a way that you want to work at it. What it will be Questiond When the Sun rises do you not see a round Disk of fire somewhat like a Guinea O no no I see an Innumerable company of the Heavenly host crying Holy Holy Holy is the Lord God Almighty I question not my Corporeal or Vegetative Eye any more than I would Question a Window concerning a Sight I look thro it & not with it. So next time you open a window – whether a literal one or a digital one on your PC – think of Blake, and see if you can see a world inside. Why not try writing your own ‘Proverbs of Hell’? The William Blake Society is running a competition to find the best modern-day aphorism – the winning entry to be judged by Stephen Fry. Full details are available at The Blake Society website. Closing date for entries was 14th August 2014. Entry is free and you can enter as many aphorisms as you like! Exuberance is Beauty! Roderick Tweedy is author of The God of the Left Hemisphere: Blake, Bolte Taylor and the Myth of Creation, editor of Karnac Books, and an enthusiastic supporter of the user-led mental health organisation, Mental Fight Club. I’m still ‘ere, & it [this fatuous quip] ‘s still nonsense, whether it makes sense to you or not… I’m watching you, lad!